Route 20 Coast to Coast: State 9 to Springfield cont. Palmer, 42.2 m. (pop 9437, sett. 1716), was known as the Elbow Tract until its incorporation, when it was named for Chief Justice Palmer. It has developed industries producing cotton piece goods, wire... At Palmer is the junction with State 32. At 43.4 m. US 20 crosses the Quabog River. A pile of stones (L) in the middle of the river is the remains of Scott's Bridge, built in Colonial days and used by General Washington on his way to Boston in 1775. At 47.2 m. is a junction with a side road. 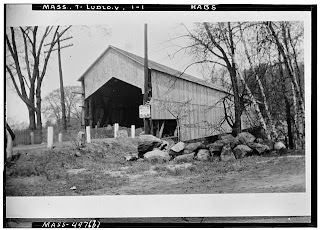 Right on this road 0.2 m. is an old covered bridge spanning the Chicopee River. Built in 1852, this bridge is the last of its kind in Hampden County.